HIRAM MOREY, one of the old settlers of Mulberry Grove, Ill., resides on section 36, in this township, and is regarded as one of the prominent men of the place. He was born in Licking County, Ohio, July 3, 1818, and is a typical native of the Buckeye State. The father was David Morey, who was born in 1793, near Rutland, Vt., and when he had attained years of maturity-he started Westward. At that time Ohio was a wilderness and those who came from New England were regarded by the old residents there as very brave people. Mr. Morey came direct to Licking County, Ohio, and remained there, where he married. His father, Joseph Morey, was a native of Vermont and was descended from English and Welsh ancestors. This combination of two sturdy races has always been regarded as a very happy one for the descendants. The mother of our subject was Harriet Reynolds, who was born July 29, 1797, near New Haven, Vt., and came to Ohio at an early day, her parents having joined fifteen other families and made the trip to that State. The settlement of this party was made at Grandville, Licking County, and at this place the father and mother of our subject were married and lived there until 1826. At this time it seemed desirable to make a change, and Mr. Morey removed his family to Knox County, where in the course of time he died, in his seventy-fifth year, having been noted for his integrity and sterling honesty, which qualities were fostered during his early life among the hills of Vermont. The mother of our subject only lived to the age of fifty years, but her memory is still tenderly treasured. Mr. and Mrs. Morey were the parents of ten children, two daughters and eight sons, all of whom grew to manhood and womanhood, respected members of the communities in which they lived, and where they reared families of their own. Only five of these children are now living, and of the original family the Mr. Morey of this sketch is the second son and second child. 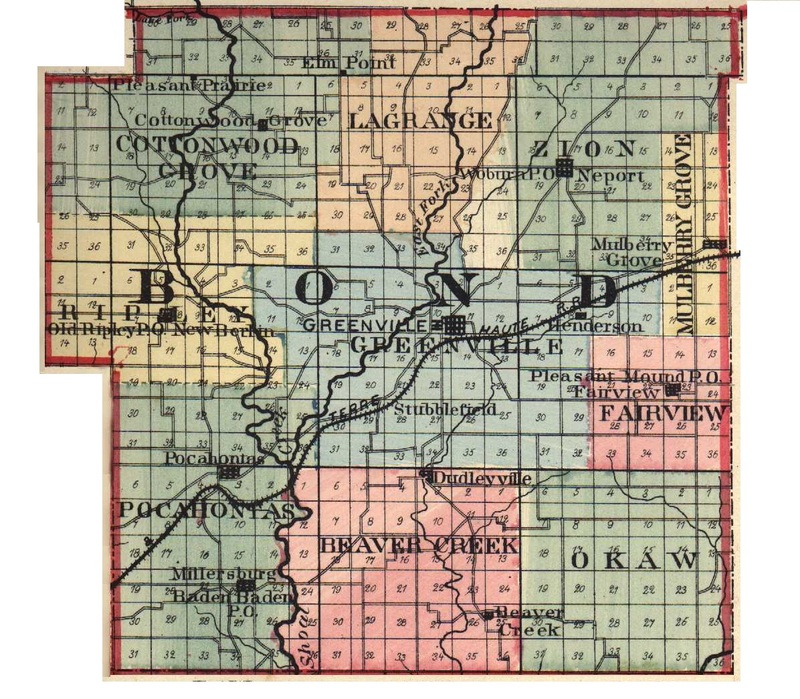 Our subject was reared in Licking and Knox Counties until 1841, when he came to Bond County, Ill., in search of the proverbial fortune which is always a little farther West. He found employment in the agricultural regions of Illinois, and in 1845 he was married to Eliza J. Brown, of Fayette County, Ill., who left at her death ten children, whose names are as follows: Sarah; Thomas Perry; Dorcas, deceased; Elizabeth A., deceased; Harriet; Henrietta; Celestia E., deceased; Laura Bell; Amitta J. and Orrin M.
Mr. Morey selected for his second wife Mrs. Nancy (Baker) Davis, the widow of William .J. Davis. The first marriage of Mrs. Morey was with William Heston and the four children of that marriage are, Sarah, Emma, James and George. Her second husband was William J. Davis, and the six children of that marriage were Frank and Albert, twins; Rosa B.; James; Marion, and one who died in infancy. Mr. Morey located on his present farm immediately after his marriage in 1845 and began housekeeping in a log cabin, 16x16 feet, but built the house where he now lives in 1857, which is very comfortable and commodious and in which he conducted a hotel for about ten years. His means were very limited when he reached Illinois and he gladly accepted $8 a month for anything that he could get to do, and agreed to take half that sum out in cornmeal. At one time he drove cows to St. Louis and sold them for $6 a head and sheep for 11.50 a head. He learned the wagon-making trade and when he came to Mulberry Grove he opened up the first shop of that kind in the town and continued at that business for a period of thirty-five years. His present farm consists of two hundred and fifty-five acres, which he rents. At one time he owned four hundred acres, but he disposed of part and does not care to work on the other part. Since the war Mr. Morey has been a Republican and believes thoroughly in the principles of that party. For the last fifty years he has been a member of the Methodist Episcopal Church. All his long life he has been a hard-working man and richly deserves the success which has come to him in his old age. Extracted 21 Dec 2016 by Norma Hass from 1892 Portrait and Biographical Record of Montgomery and Bond Counties, Illinois, pages 436-437.